We set out at 8:30 AM or so on January 15th from our house in Cape Town. It was bright and early in the morning. 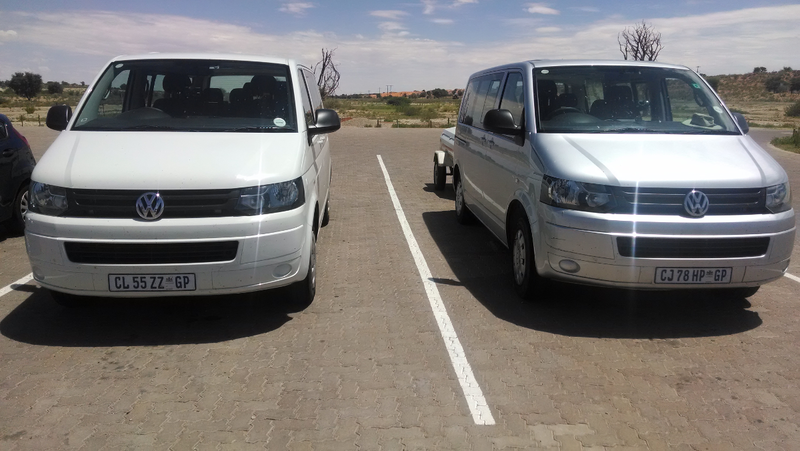 We left in two Kombi (VW Vans) along with a trailer. They served us well throughout the trip. Fynbos is a strange plant in that it actually requires burning every 15 years or so. You see it mostly in the Western Cape, and to me it looked a lot like normal shrubbery at first glance. 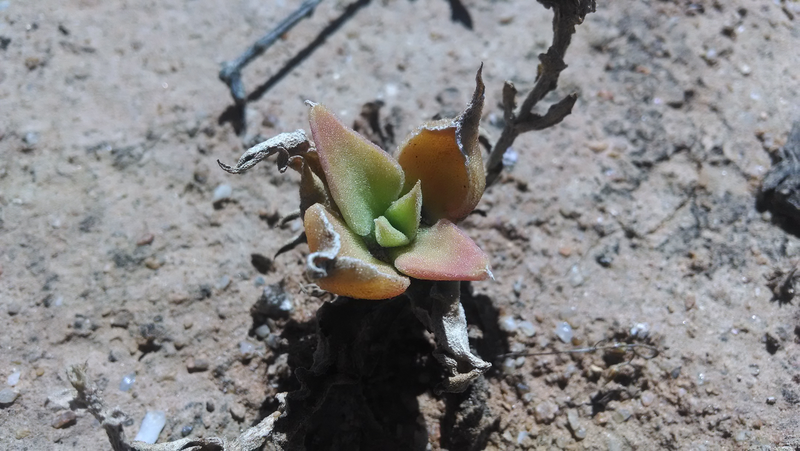 The seeds are unable to germinate though until they experience the intense heat of a bushfire, which is unfortunate because all of the alien species in the Western Cape cause fires to get out of control, which can damage the other crops or even people's houses. 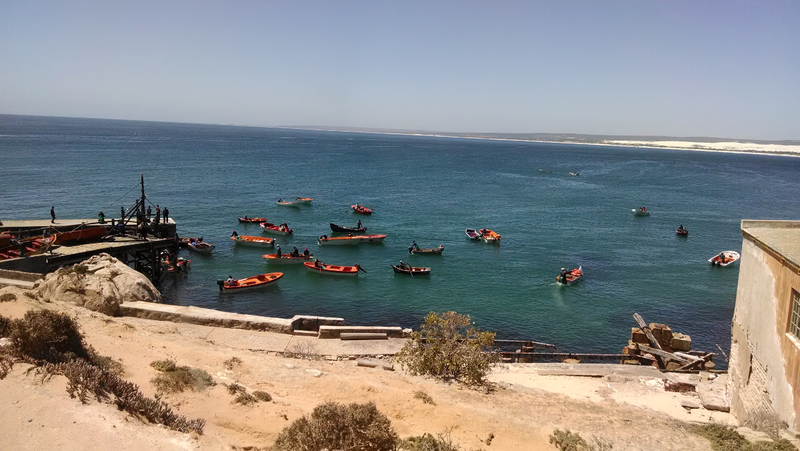 We continued on in the Kombi, and eventually stopped in Elands Bay. We passed several fishermen, and they were hauling in a massive catch of crayfish. Pretty much all of this is destined for export, which makes sense given that South Africa is currently an industrial export focused economy. While the town does look quite nice, the biggest issue is that our driver asked one of the fishermen what the price they sold it, and the middle man makes an enormous profit before selling it abroad. In this small fishing town, there is a small cave which has some of the earliest cave paintings that anybody has discovered. Most of the cave paintings are handprints, but there are also several animals, although you can't see much in my picture sadly. Right now, there is almost no potable water in the area, however twenty thousand years ago the area was much wetter. 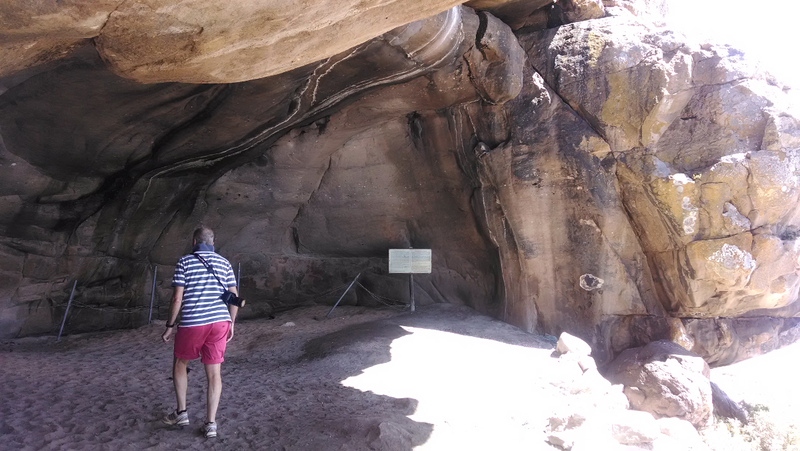 This meant that the cave was most likely a great resting place for the people that lived in that time. 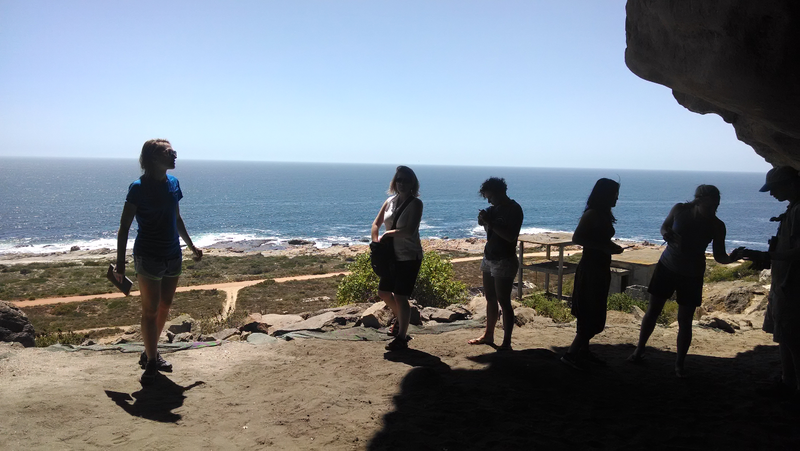 The view from the cave wasn't half bad either. 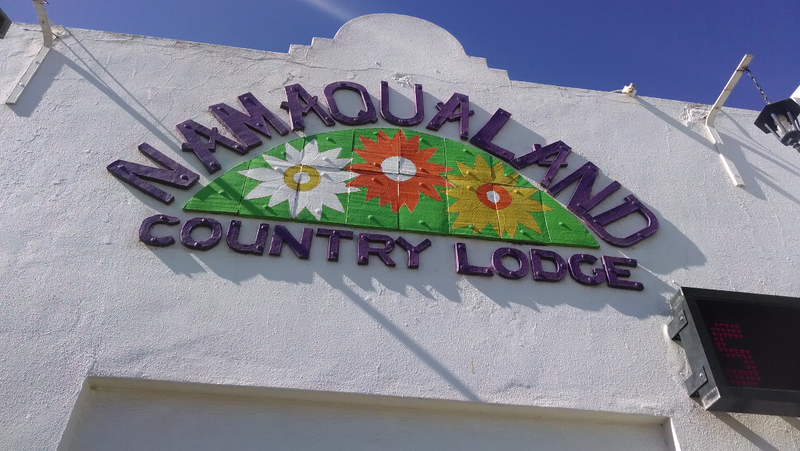 After this stop, we continued on to our destination in Namaqualand, the Namaqualand Country Lodge. The organizers had accidentally booked the wrong day, but they were quite nice and let us stay anyway, partly because this time of year the hotel is empty. In the area, there are these beautiful daisies that bloom and attract a massive quantity of tourists, but that certainly was not while we were there. They didn't quite manage to mobilize the kitchen staff though so overall it was an eh place to stay. Theoretically, we could drink the water although I didn't actually try. 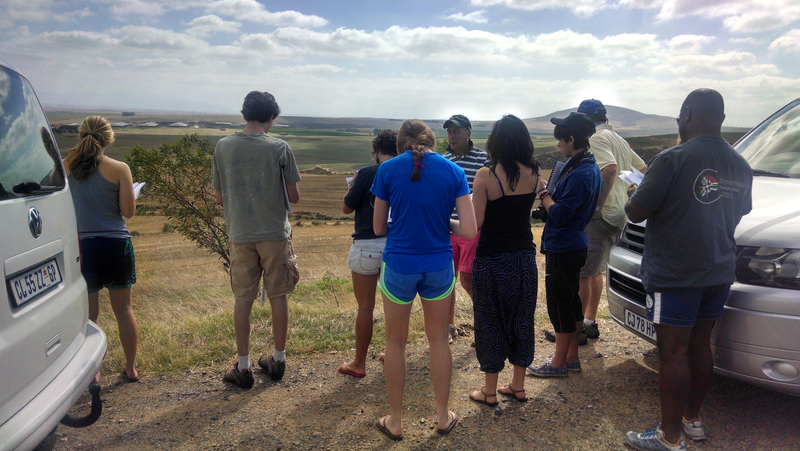 We woke up the next morning and drove for a little while until stopping on the edge of a random farm. 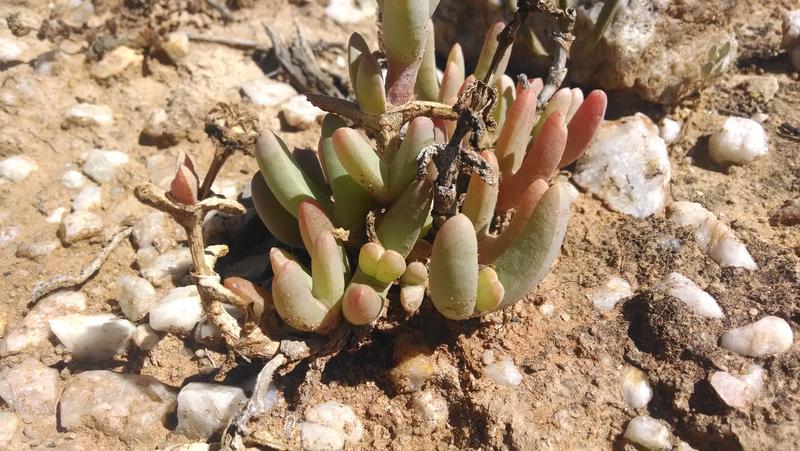 Namaqualand has the highest number of succulents in the world, so we stopped to take a look for a little while. Most of these plants have developed the photosynthetic pathway CAM. In (very) simple terms, photosynthesis requires carbon dioxide and solar radiation. 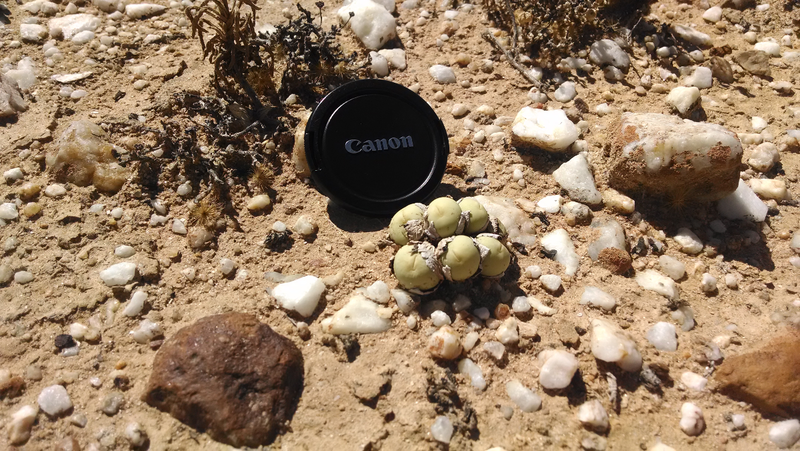 To take in carbon dioxide, plants have to open their stoma, which also lets water out in these arid conditions. So instead, the plants have adjusted and take in carbon dioxide at night, store it, and create their sustenance during the day. Here are a few examples. We travelled to the Oranje Rus Resort which was absolutely gorgeous. 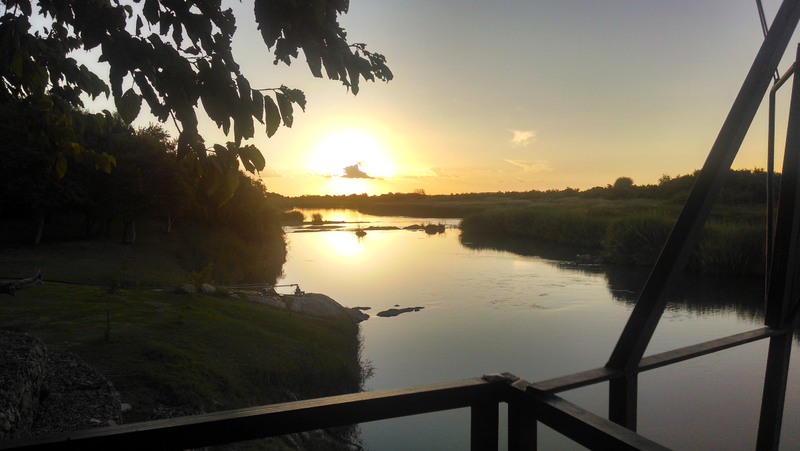 It was on the side of the Orange River. From this arid region, within a few kilometers of the Orange River you start to see vineyards and all kinds of agriculture thanks to the water pulled from the river. Our room had air conditioning as well, and the sitting area where we had our drinks was just gorgeous. 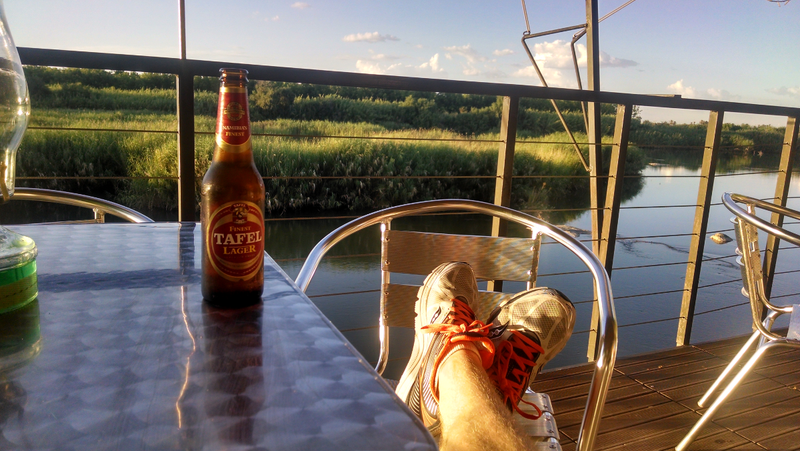 I just had to grab the classic photograph of the feet up and a beer. After the sunset, we sat down to a great meal where I had a very well prepared sirloin and some good wine. We were the only people at the resort, so I think the staff may have babied us a little, but it was a great place. I'll try and post the next couple days as soon as possible.